Fishermen pulling the saw shark to the shore at Kampung Bruit, Daro. Sawfishes are warm water, shark-like rays characterized by long, toothed snouts (rostra). 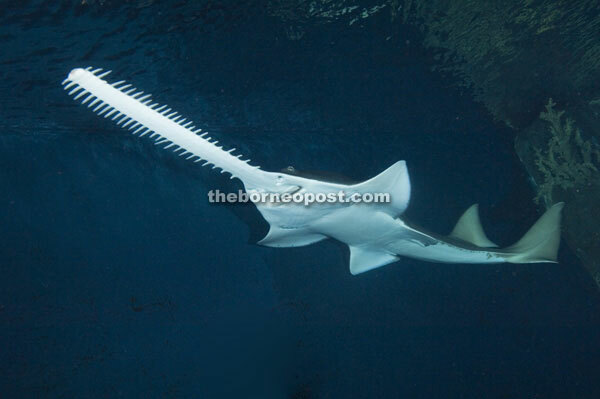 KOTA KINABALU: The Borneo Marine Research Institute, Universiti Malaysia Sabah (UMS), is working with the IUCN Shark Specialist Group and Sawfish Network comprising international researchers and volunteer experts, to save the iconic sawfish of Borneo from their dwindling population. Heading the effort in the Borneo Marine Research Institute is its senior lecturer, Dr B. Mabel Manjaji Matsumoto, a statement from UMS said yesterday. Sawfishes are warm water, shark-like rays characterized by long, toothed snouts (rostra). They reach over seven meters in length and are the largest members of the rays. A recent report by The Borneo Post of a trawl-net capture of a 5m long sawfish (reported as a ‘saw shark’- which is actually its close shark-relative) from Kampung Bruit, a coastal village on Bruit Island, Daro in Sarawak (approximately 60 km from Sibu, the nearest town accessible by air), highlighted the rarity, as well as the vulnerability of the sawfishes. Photographs included in the report revealed that the sawfish was a female, with an everted cloaca, of the Largetooth Sawfish (Latin name: Pristis pristis). Reported as incidentally caught, the 25 June 2014 report is the first known record of sawfish from the Daro area. The Sarawak sawfish report comes only almost three weeks after the IUCN Shark Specialist Group released a report (on 5 June 2014) on a global strategy for conservation of sawfishes (Harrison & Dulvy, 2014). The sawfish report noted that once found in the coastal waters and rivers of more than 90 tropical and subtropical countries, all five species are today classified as endangered or critically endangered on the IUCN Red ListTM. Mortality from targeted and incidental fishing is the main threat to sawfish. Their rostra – which they use to detect and wound prey are easily entangled in many types of fishing gear, particularly trawls and gillnets. The destruction of key habitats, such as mangroves, also poses a threat to sawfish survival. Other recent records of sawfishes in Sarawak are from central Sarawak near Bintulu (Last et al., 2010), and from ‘off the Sarawak coast’ (Cavanagh & Mycock, 2014). The species reported from Bintulu is the Green Sawfish (Pristis zijsron), but without further details provided. Cavanagh and Mycock reported a 6m long sawfish (species not identified) trawled in 1996, based on a photograph found in a Chinese medicine shop in Kuching. 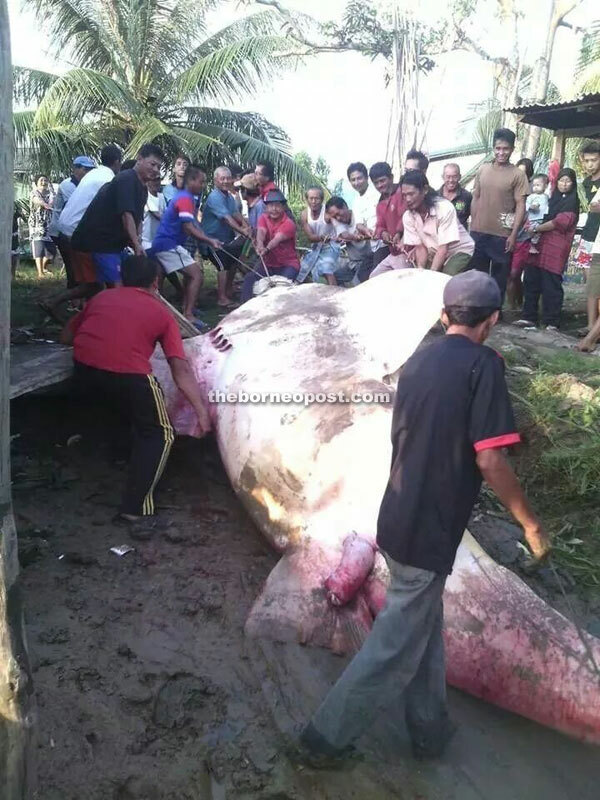 In Sabah, the last known record of sawfish occurrence (a Largetooth Sawfish) is from Sukau (a kampung on the Kinabatangan River), caught by a fisherman there in 1996 (Cavanagh & Mycock, 2014). Elsewhere in Sabah, records are based on the dried rostrums of Narrow Sawfish (Anoxypristis cuspidatus), Largetooh Sawfish and Green Sawfish kept by villagers living along the Labuk Bay and Segama River (Manjaji, 2002). In Kalimantan (Indonesian Borneo), the only records of sawfishes (Narrow Sawfish and Green Sawfish) are both from southern Kalimantan (Last et al., 2010). As the world’s largest ray, and most threatened marine species, the recovery of sawfishes is being prioritized by shark specialists. Some of the suggested conservation strategies – built on sound knowledge and scientific research – to help populations recover are fairly simple. For example, sawfish are known to survive capture quite well if handled properly, and hence, basic education of commercial, subsistence and recreational fishers is central to sawfish conservation strategy. Such strategy and approach has improved the status of the Smalltooth Sawfish in the US. Four of five species of sawfishes have been recorded in Malaysia. The most recent report of a Borneo sawfish from Sarawak is encouraging – that sawfishes still existed in Borneo – and provides a hope to conserve the remaining population. As current knowledge of sawfish distribution in Malaysia is patchy at best, much needs to be done to better understand the distribution of sawfishes throughout Malaysia; this may be done by interviewing fishers and conducting surveys. While it is important to increase efforts to raise awareness of the plight of the sawfishes, particularly in areas where they have been recorded, or where they are thought to occur, the relevant government department is urged to take action and enforce the existing legislation that protects the sawfishes as endangered species.